is at our very fingertips. perhaps a step on the slow cloth trail…giddyup young cowboys. 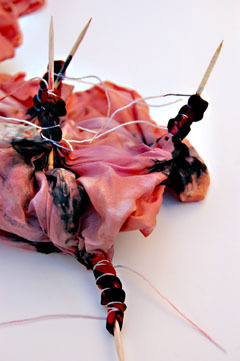 This entry was posted in artists teaching art, indigo, shibori, silk, teaching kids on May 2, 2010 by shiborigirl. Once there was a little girl who had a few hundred struggles. She went to see a wise woman to see what could be done about letting some of them go. The wise woman talked to her in a soft voice and offered her some objects to explore. One was a little indigo bag that was said to carry the moon. Inside the bag she found some stories and some dreams. Some stories were stitched into cloth and some were carried along a stream of silky colorful pleated ribbons. These things gave comfort. The dreams revealed themselves and she saw her grandmother’s hands, felt love, found safety. She saw beauty and wondered. Some of her struggles melted away. when i wonder why i ever ended up here, i’ll come back and read this story. This entry was posted in arashi shibori, shibori, shibori ribbon, silk, teaching kids and tagged stories on August 29, 2009 by shiborigirl. Dare I ask? Just what IS the role of an artist in society today? I think I just heard a strange sound…..must have been the sound of a can of worms being opened. I pose this question in the wake of being accused by a local “arts advocate” of not participating, of sitting on the sidelines and criticizing instead of “rolling up my sleeves and making change by participating”. And all along I thought I was participating! So I started wondering, just what exactly is it that is expected or desired of a artist in our society/community today? Let me begin by saying that I am as confused by this question as anyone. I could come up with some eloquently waxed statements on the matter. It of course leads to other questions-such as, “What is the role of ART in society today?”. And the omnipresent question “What is ART?”. Let me start small. Sometimes nibbling around the edges lets me figure things out as I go so I’ll just start by saying that making things with my hands seems to be embedded deeply in my DNA. Also, that I’m not really convinced that I am an artist. See I told you I was confused. If I ever had to go out and get what my parents termed “a real job” it wouldn’t quell the deep need I have to create things. Perhaps a 12 step program or a religious conversion would do the trick, but I doubt it. It’s just there. So I have gone along with it since I was a child and worked it out so it could pay the bills. Does everyone need art in their life? -probably not, of course there are many cases one could site on this one. Are we happier as a society with art and artists in our midst? -here is where it gets more difficult. More subjective. we as humans have a need for beauty be it in the context of nature, our surroundings, or by creating it ourselves. Furthermore, by definition, the term artist can be construed to mean many things. Many artists I have met (and from here out I will use this term inclusively and without judgment ) create because they cannot NOT create. Are you an artist because you created something? 5 things? 10,000 things? Is there a point at which your productivity becomes so great that you are no longer considered an artist? First you are an artist, then you are an artist with bills to pay. You become a production artist. Overhead increases. Now you are a Manufacturer. Well, you can see it starts to get a little messy here. I have been in all of these situations. Back to the question. The artist’s role in society. Do artist’s have a responsibility in society? Should they create beauty for others to enjoy? Should they lead by example? Should they share their vision and their creativity with the public by teaching? Should they communicate with other artists from around the world? Should they all participate by dictate and attend meetings hosted by tireless arts advocates? How about Jane and her work over the past two years at Mundo Lindo (Beautiful World) which is now coming to a close. And if you know me you may be familiar with Elementary Art . Please feel free to post links to any you know here in the comment section (this could get pretty lengthy!). Of course we are only scratching the surface here but the bigger question really is would the community rather see the likes of us at bored meetings or out doing stuff? It’s somewhat disingenuous to say you want our ideas and opinions yet when we give them and you don’t like them tell us we aren’t part of the solution because we aren’t playing by your rules. Artists and musician types often make great sacrifices in lifestyles in order to choose these paths as a career. It’s not 9-5. There are no paid vacations. You often work 80 hours a week. You almost never get paid what you think you should. Forget about health insurance of any real substance. Bottom line, if I’m not gonna get paid for my volunteer work, would I rather be in a bored meeting or in a roomful of children? I think you can guess my answer. If you want my ideas, feel free to email me. No meetings required. Until further notice, only paid gigs are being considered though. 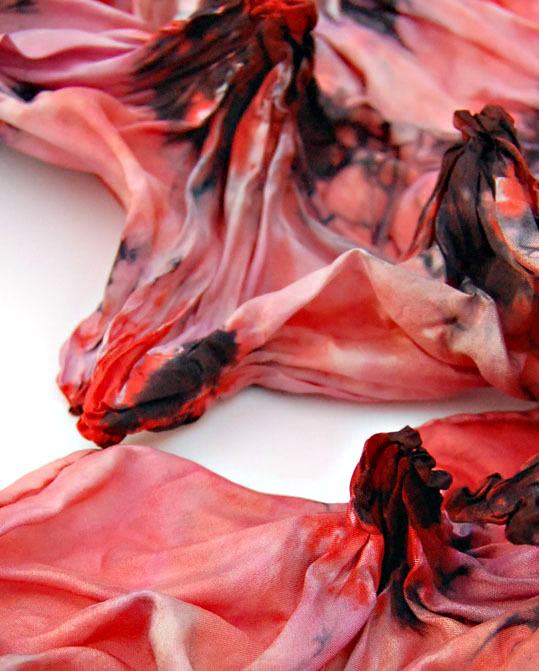 Countdown to Chicago continues…..dyeing and processing the last of the silk for the show. Just booked a series of workshops in Claremont over the next 5 months. More details will be posted shortly on the classes and shows page….gotta go and get busy now! This entry was posted in art, artists teaching art, business of craft, contemporary shibori, dyeing, experimenting, inspiration, LBUSD, long beach art, not about shibori, shibori, silk, teaching kids, where to find my shibori, workshop and tagged Antonio Ruiz, arts education, create long beach, Dramane Kone, Pan Afrika, role of artist, Steel Parade, Trash for Teaching on April 9, 2009 by shiborigirl. -and asking myself “what is the point?”. Having so much that needs to get done before Chicago and the study trip to Japan while at the same time being called out online for “standing on the sidelines criticizing instead of rolling up my sleeves and doing something”. This I get for publicly stating my opinion on recent discussions ( LBPost )about the future of art in our fine city of Long Beach. I admit I said the E word (education) and as you know, it is something I am passionate about when it comes to public education. But to be called out both on a youtube video as well as in a public forum by (get this) the same person who “borrowed” one of my ElementaryArt pics from my blog and then used it to promote himself without permission, attribution or anything just left me feeling a little prickly. So, in retaliation, I headed to the studio to work where I had several rewarding days with dye and silk. Releasing the threads that bound the pent up fabric and removing the sharp and now unnecessary barbs the silk rewarded me with small volcanic-like mountains complete with lava flow and molten ash. Very Icelandic- thank you Gudrun for your book of paintings based on natural surfaces in Iceland-just marvelous! You can see her work hanging in the airport in Reykjavik when you arrive (and by the way she is my sister in law). 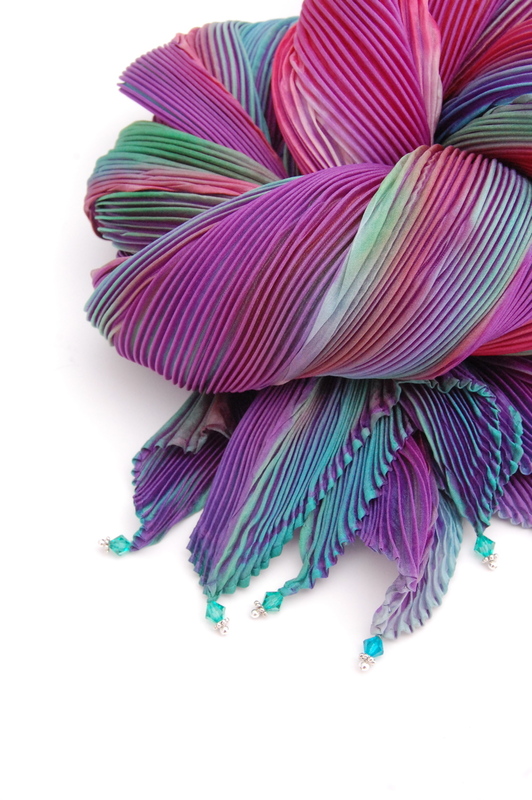 So much inspiration in your work- I see all sorts of “scapes” for shibori work there. 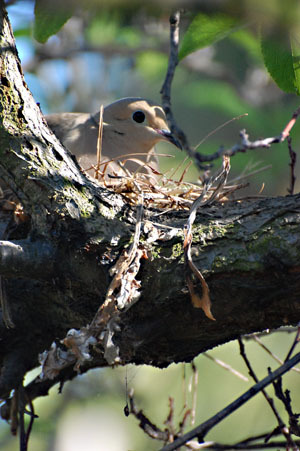 momma dove sitting on her nest in the plum tree. 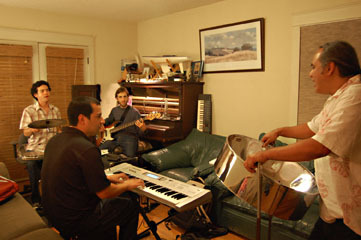 Plus I get to iron silk while a band rehearses in the next room. This entry was posted in arashi shibori, art, artists teaching art, contemporary shibori, dyeing, experimenting, inspiration, LBUSD, long beach art, shibori, silk, teaching kids, workshop and tagged antonio pedro ruiz, create long beach, long beach on April 4, 2009 by shiborigirl.